Congratulations to King Willem-Alexander of the Netherlands, who celebrates his 50th birthday today! To mark the milestone, we're hopping in our bejeweled time machine for a visit to his 40th birthday party. 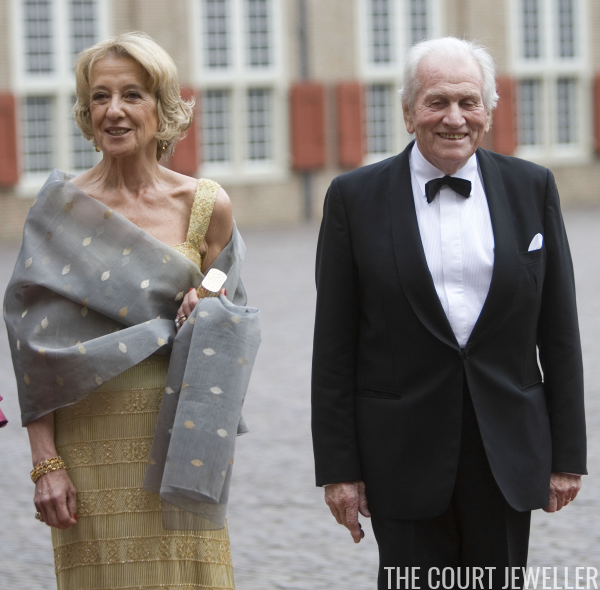 This is part one of our flashback; stay tuned throughout the day for even more royal guests! Although Willem-Alexander's birthday is in April, his big 40th birthday bash was postponed until September, for a very good reason: the birth of their third daughter, Princess Ariane. 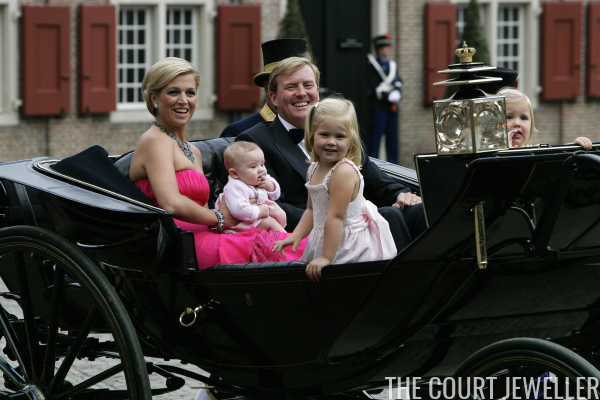 The entire family arrived for the birthday party at Het Loo in a horse-drawn carriage, including the new baby. ...and at her bracelet. 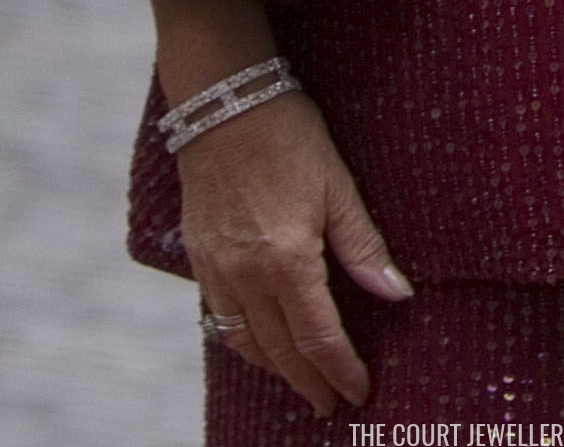 She's also wearing her ruby and diamond ring (a gift from Willem-Alexander on the birth of Princess Amalia) on her right hand, and her engagement and wedding rings on her left. She paired a relatively simple pair of diamond earrings with the bright jewels. 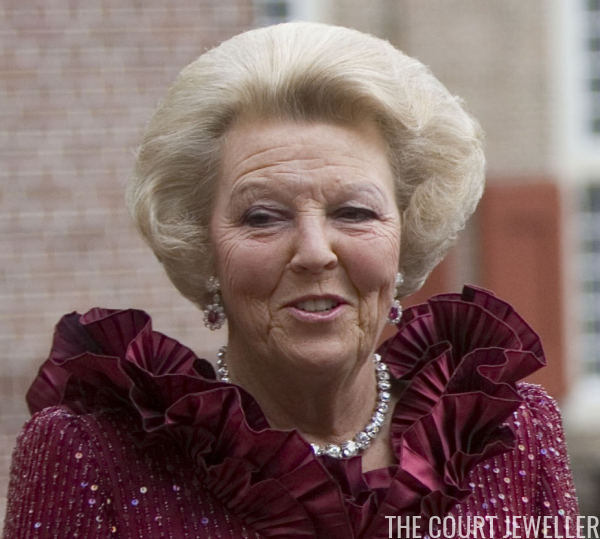 Princess Beatrix (who was Queen Beatrix in 2007) wore shimmering red for her sons's party. 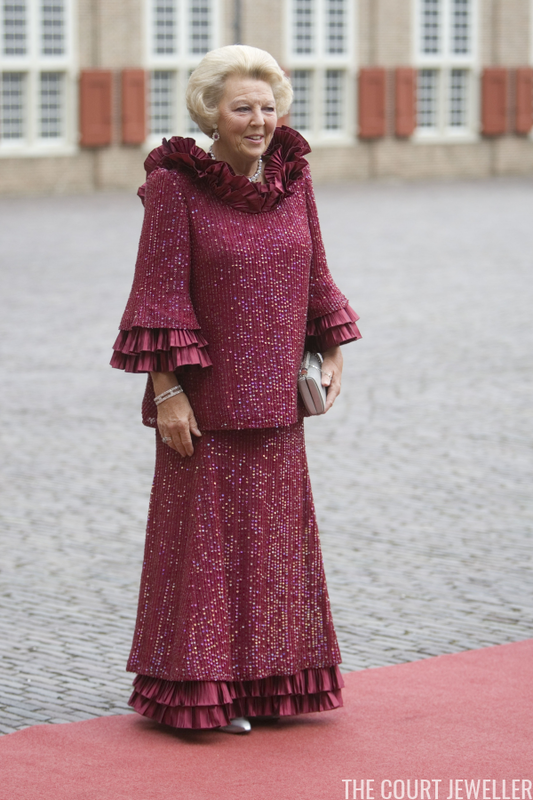 Three years later, she wore the same ensemble for the wedding of Crown Princess Victoria of Sweden. 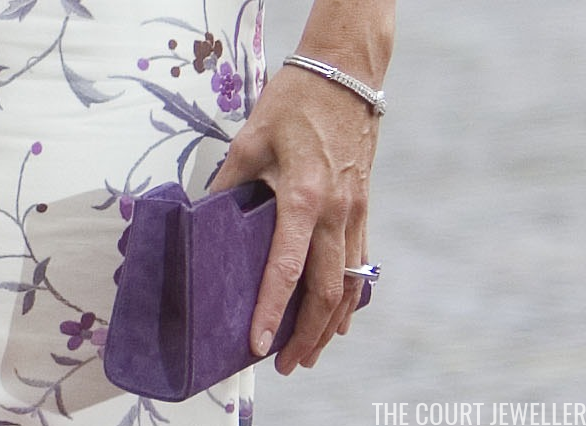 She accessorized with ruby and diamond earrings and a diamond riviere. 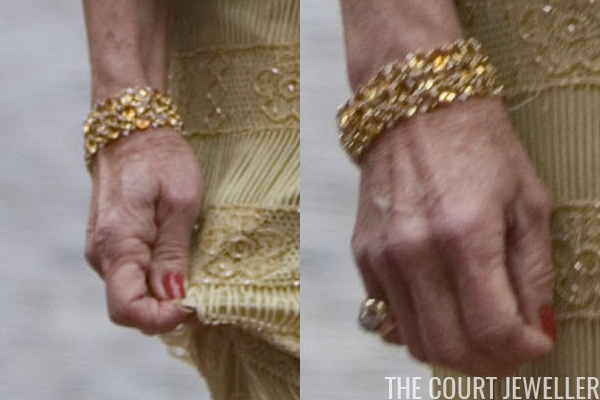 On her right wrist, she wore one of the East Indies diamond bracelets. 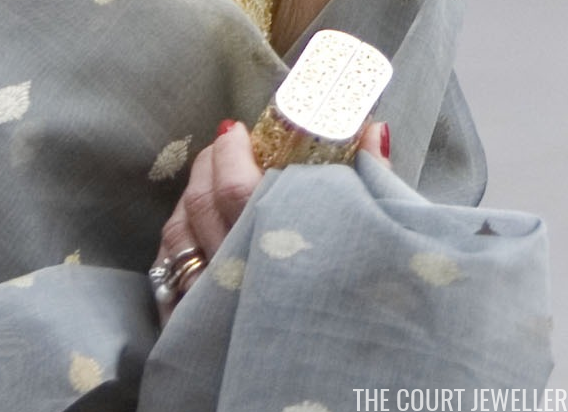 Her engagement and wedding rings are also visible on her right hand. 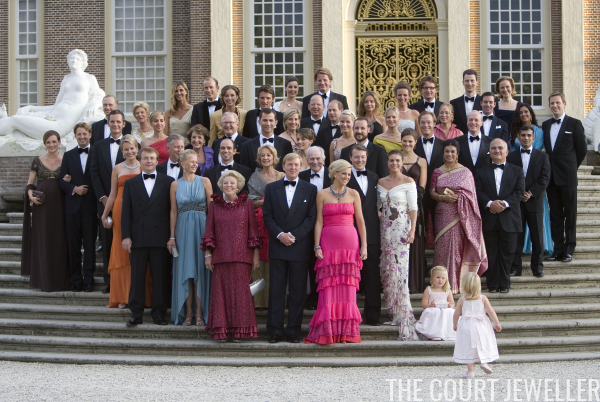 Queen Maxima's mother, Maria del Carmen Cerruti, also attended the party, as did her father, Jorge Zorreguieta. Carmen wore some familiar jewels from her daughter's jewelry box for the event. You'll recognize these earrings, which feature citrine briolette drops. And you'll also be familiar with this large bracelet, which is set with diamonds and various shades of citrines. A cocktail ring is also visible on her right hand. Carmen also wore a stack of rings on her left hand. Princess Mabel of Orange-Nassau, wife of Willem-Alexander's younger brother, Prince Friso, wore a soft blue gown for the occasion. 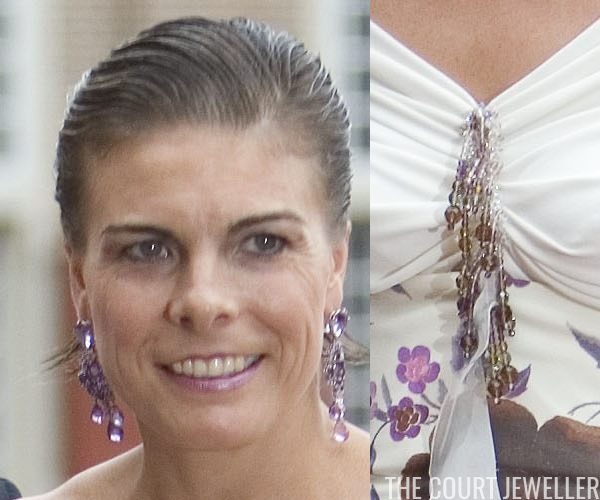 Her earrings, which feature a floral stud and a pale blue drop, coordinated with the dress. We also got to see a hint of a diamond bracelet on her right wrist. Princess Laurentien of the Netherlands, wife of Willem-Alexander's youngest brother, Prince Constantijn, wore a flirty floral gown for the party. 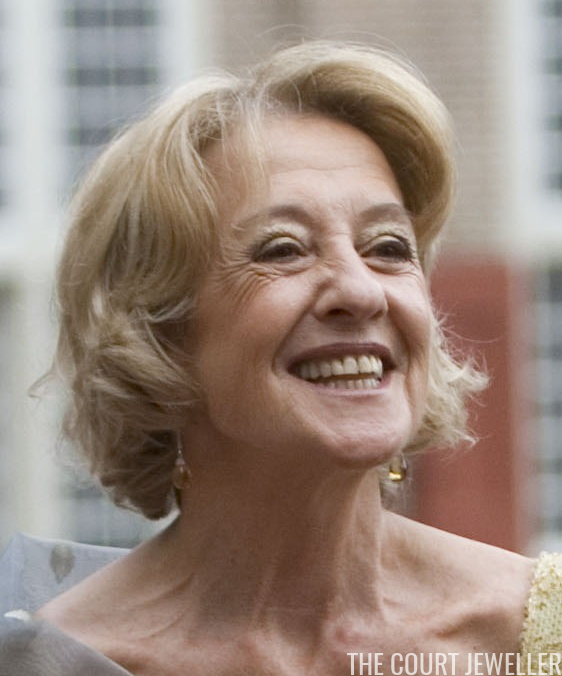 Her earrings appeared to coordinate with the embellishment on the bodice of her dress. 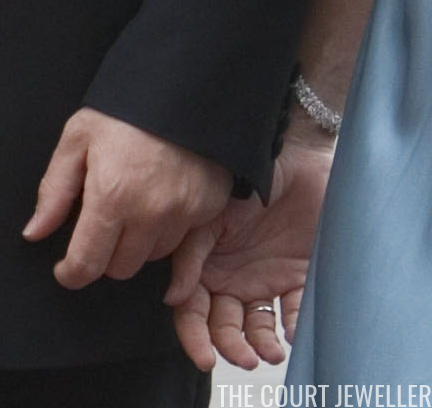 She also wore a diamond bracelet on her left wrist, plus a ring on her left hand. Constantijn and Laurentien helped save the day after the photocall on the palace steps, when little Princess Alexia went rogue. 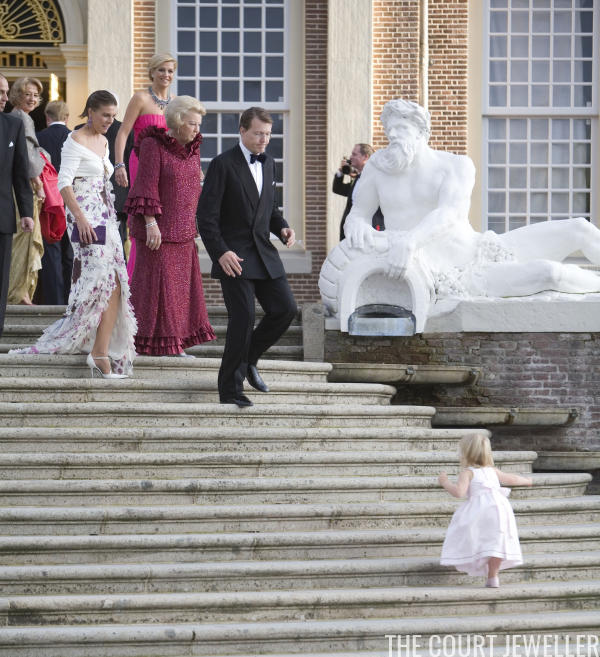 Uncle Tijn -- who has three little ones of his own -- demonstrated some deft parenting skills as he rescued the princess. 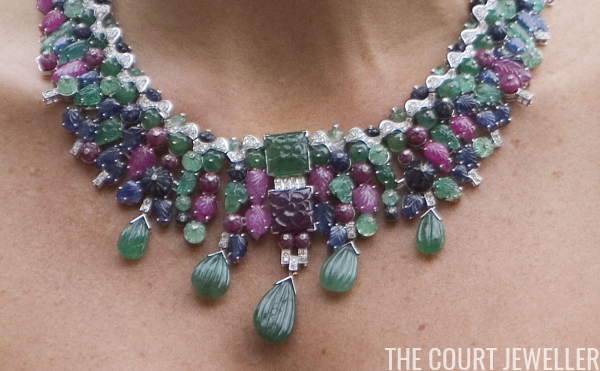 Next up: stay tuned for the jewels worn by the members of the extended Dutch royal family!